Veeam confirms that this is a known issue KB2191. 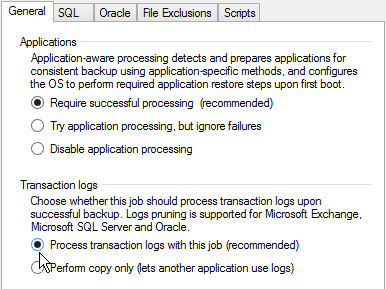 The failure comes if you disable the log truncation for Microsoft SQL in the job properties. If you enable SQL log truncation even if there is no SQL in this job everything works as expected. Because it is a known issue I think it will be fixed in the next update. Until it is fixed you have to enable SQL log truncation to get Exchange logs truncated. This was driving me crazy. Thanks!